Customer Service Center retrieves product pricing (including price adjustments and tax) information from B2C Commerce in real time via API calls. The OM-Digital Connector, a B2C Commerce Cartridge, facilitates ongoing synchronization of various data between B2C Commerce and Order Management, including items and catalogs, inventory, and pricing. In legacy systems, the Connector also managed synchronization of orders between B2C Commerce and Order Management. 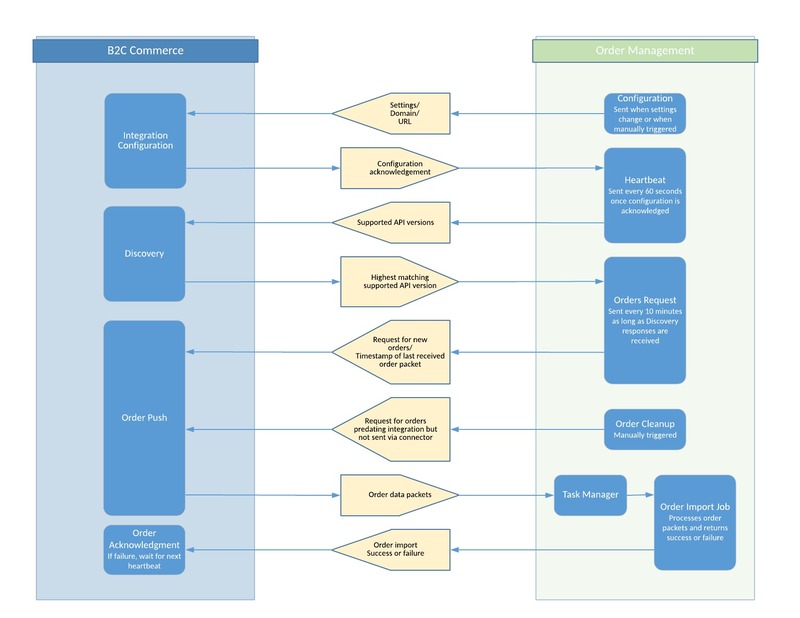 When B2C Commerce sends orders, Order Management manages all further elements of the workflow, including product allocation, shipping and return orders, and customer service. The most common system is to master inventory data in Order Management while importing orders and retrieving pricing and product information from B2C Commerce. Data Management Mastered in Order Management. Mastered in B2C Commerce. Created in B2C Commerce and sent to Order Management on a regular schedule. Entered in Customer Service Center. Mastered in Order Management. Functionality Exported from Order Management to B2C Commerce on a regular schedule. As products are browsed in Customer Service Center and added to orders, prices are retrieved in real time from B2C Commerce. B2C Commerce performs any promotion calculations, then returns the adjusted prices to Order Management. Order Management has no direct exposure to promotions. Sent from B2C Commerce to Order Management on a regular schedule. Product and pricing (including promotion and tax) data is retrieved from B2C Commerce as each order is entered. Customer information is entered in Customer Service Center or retrieved from Order Management. Available inventory levels are exported from Order Management to B2C Commerce on a regular schedule. Advantages of the New Order Integration. The setup and configuration process. Designing records (including Items, Item Attributes, Categories, and Catalogs) in such a way that they can be synchronized between the two systems. This mapping is configured in the Demandware provider. Understanding the Data Synchronization Schedule.